Great Track to cut your teeth on for medium tracks. The track ends near Toombon, close to the Merringtons Campsite. Early in the track, it has a couple of small creek crossings, and some decent climbs, decents. 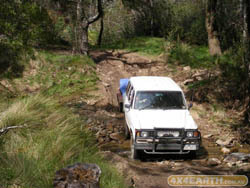 It was partially closed when we went through about 3/4 way through the track, so we had to reverse and go back 50 mtr\'s, and drive along a creek for about 150 Mtr\'s. Most of the tracks has a sharp drop either side, with the end of the track a decent creek/river crossing required, so decent height on your vehicle is needed. There are other tracks come off this one, namely Army Track (Hard) and Whitestar (extreme), also get too see a grave of a man and his dog, and some little huts on the track as well. But overall, a great track, mostly rocky, some sharp corners and some deep water ruts on the track. We done with a trailer, and a friend had a camper trailer on, so, go for it.